With precocious charm and a keen eye for details, Marzi is an autobiographical account of the author’s childhood growing up in Communist Poland during the height of the Solidarność movement. 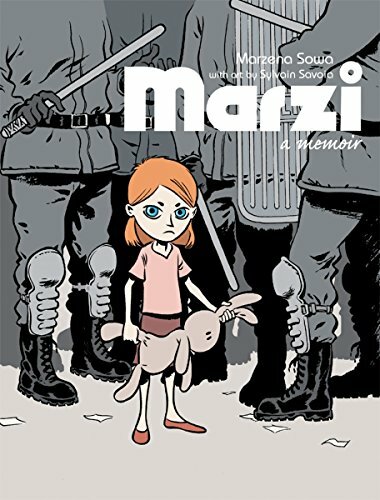 Similar to other autobiographical comics such as Marjane Satrapi’s Persepolis or Aleksandar Zograf’s Regards from Serbia, Marzi differentiates itself by focusing less upon the political climate of her day, and far more on how that climate affects her attempts to have an otherwise normal childhood. The story, presented as a series of vignettes of events inspired by the author’s insightful memory of her childhood, is complemented by her adult sensibilities which makes each concise and accessible to the reader. Through her relationships with various friends and family, we are presented a with a picture that compares and contrasts Marzi’s simple life in Poland with the lives and resources of those outside of her country (or those whose increased wealth sets them apart). Perhaps the most interesting aspect of the story is the author’s complicated relationship with her parents, particularly her mother. Marzi is spared most of the direct trials and government oppression that her father (and other Polish factory workers like him) suffered under in the 1980s, and instead the main source of Marzi’s so called “oppression” stems from her anxious and overbearing mother. Indeed the political landscape takes a backseat to this conflict, and Marzi spends more time trying to piece together on her own what is happening in her country than discussing it, even as her seemingly well meaning parents attempt to shield her from it. This does little to ease Marzi’s trepidation, and very little seems to go unobserved by the curious and cautious child, even if she doesn’t quite grasp their meaning at the time. Overall, Marzi is a coming of age story, and her dreams and fears are those almost any person can relate to, regardless of the nation of their birth. Though certainly the events of her life are colored by the restrictions specific to those living behind the Iron Curtain, it is arguable that her trials are commonly universal, having more to do with the constraints and fears of childhood than any one political ideology. Though the book has some of the same failings that many first time authors display, it succeeds in painting a clear (if not somewhat exhaustive) picture of what growing up in the Communist bloc was likely like for thousands and thousands of children. From long and unsuccessful waiting in lines for simple necessities, to the unspoken coercion into participation in political holidays, the reader yearns for a freedom that the young Marzi can only dream about, yet lacks the experience to define. Talks between the government and the Solidarność-led opposition led to the first election of a President of Poland in 1990, thanks to the bravery and defiance of workers like Marzi’s father, who risked dismissal, injury, and death to make a better world for their children. In our time, where the struggle for democracy is once again coming to the forefront of our national and international dialogue, we can look to Marzi as an example of this common struggle for democratic elections and freedom from the yoke of oppressive governments . . . perhaps even more so because it is one with a happy ending.